Leipsic’s Hayley Heitmeyer of Leipsic hits a shot against Tiffin Calvert’s Zoe Meyer during Saturday’s Division IV regional final at the Elida Fieldhouse. See more volleyball photos at LimaScores.com. 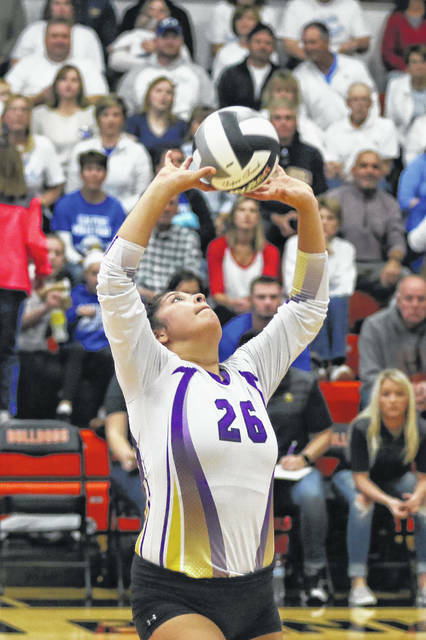 Leipsic’s Selenda Loredo sets the ball during Saturday’s Division IV regional final against Tiffin Calvert at the Elida Fieldhouse. Leipsic’s Brooke Brown dives to make a save during Saturday’s Division IV regional final against Tiffin Calvert at the Elida Fieldhouse. 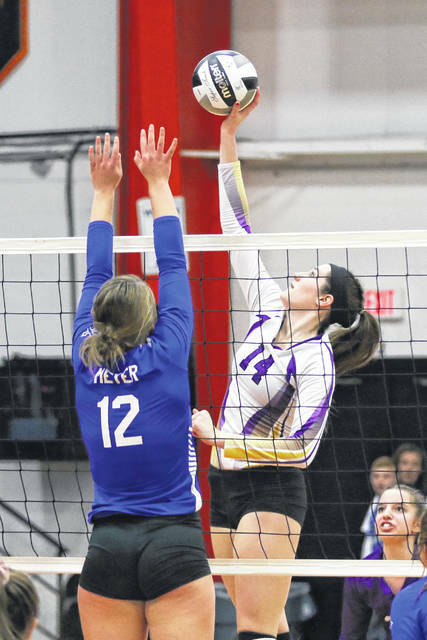 Leipsic’s Carlee Siefker goes up for a block against Tiffin Calvert’s Kate Rombach during Saturday’s Division IV regional final at the Elida Fieldhouse. Leipsic’s Liz Scheckelhoff hits a shot against Tiffin Calvert’s Ashlyn Jones (9) and Lila Gehring during Saturday’s Division IV regional final at the Elida Fieldhouse. Liepsic’s Peyton Heitmeyer goes up for a spike against Tiffin Calvert’s Kate Rombach during Saturday’s Division IV regional final at the Elida Fieldhouse. 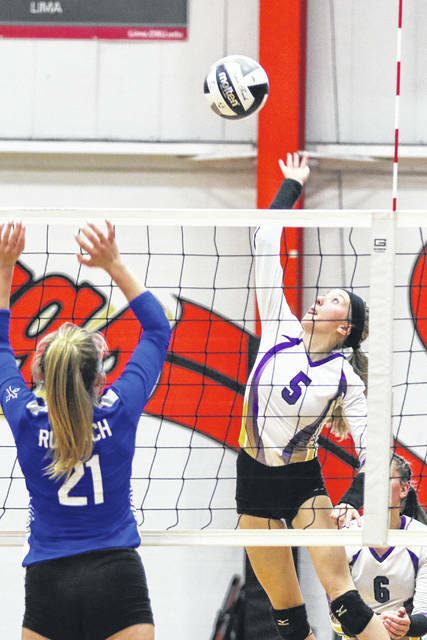 ELIDA — Tiffin Calvert did its homework and had a game plan for Saturday’s Division IV regional title volleyball match against Leipsic. However, the Senecas’ main focus was to play aggressively against the Vikings. Tiffin Calvert displayed that aggressive style of play as it defeated Leipsic in three sets at the Elida Fieldhouse – 25-21, 25-14 and 25-23 – to advance to the state tournament. Tiffin Calvert (24-3) will play in a state semifinal at noon Thursday at Wright State University against Lancaster regional champ Portsmouth Clay, a 26-24, 27-25, 26-24 winner against Portsmouth Notre Dame. 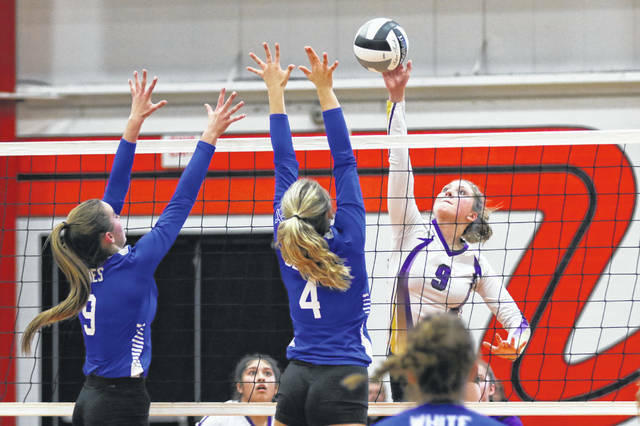 Leipsic (25-3) started strong Saturday, jumping out to an early 5-0 lead in the first set. The Vikings looked to be on their way of notching a first-set victory, leading 17-12. However, that’s when Tiffin Calvert showcased its aggressive style of play. The Senecas stormed back, took the lead and went on to notch the first set. That comeback by Tiffin Calvert set the tone for the rest of the match. Tiffin Calvert was solid on the front line. Zoe Meyer led the Senecas with eight kills. Kate Rombach had seven kills. Ashlyn Jones and Lexie White each had six kills. Emma White recorded five kills for the Senecas. 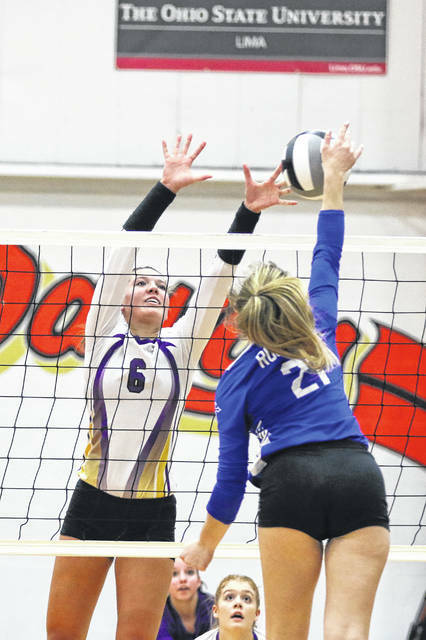 Leading the way for Leipsic on Saturday was senior Hayley Heitmeyer, who hammered a game-high 16 kills. The 6-foot, 2-inch Heitmeyer also had four blocks. Carlee Siefker had 14 kills and 10 digs for the Vikings. After being handled quite easily in the first two sets by Tiffin Calvert, Leipsic battled back in the third set and claimed a 15-14 lead. The Vikings stayed close, but the Senecas closed it out down the stretch. 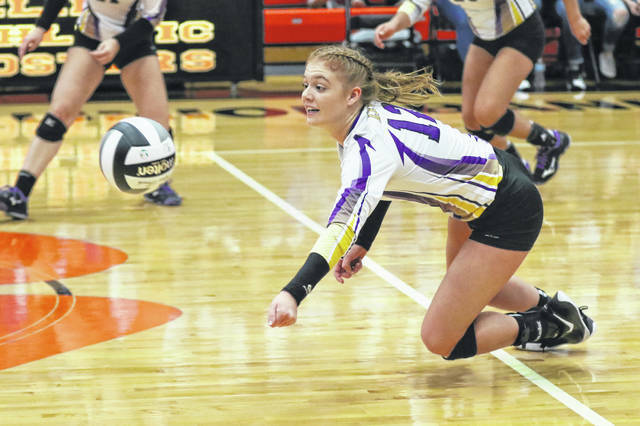 Along with Heitmeyer and Siefker, teammates Kacey Dulle (21 digs), Brooke Brown (14 digs), Lyndie Hazelton (16 assists) and Selena Loredo (12 assists) were all very active for Leipsic on Saturday. This entry was tagged leipsic. Bookmark the permalink.